← Oh no, my chakras are closed – is it terminal?? Note that the overall look of the aura is patchy, with a “thinking cap” over the head area, which indicates that I’m more in my headspace and not integrating my thoughts and feelings – sort of like a body-mind disconnect. My Chakras are not of a uniform size and shape. 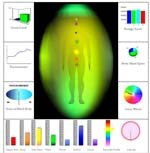 Look at the Chakra energy level bar graph underneath my aura image – the energy levels for the root, heart, throat, and crown are quite low. Even though the solar plexus Chakra has a higher energy output, the larger, almost over blown shape on the body figure indicates that I’m operating more on will power. Here is the after image. Now, the Chakras are round and evenly shaped, which shows more harmonious activity. The Chakra colors are clear, bright, and defined. All are approximately the same size. The Chakra bar graph now indicates that the energy levels have greatly increased for all Chakras. Notice that the colors of the Aura are integrated. My green “thinking cap” has merged with my overall energy field. Look at the Aura size graph, which is a circular “bull’s eye” style graph at the lower right corner of each image. In both before and after images, my auric field is equally large. This means that we can have a fairly radiant energy field whether out of balance or in complete harmony. Yes, after the session with the hypnotherapist, I felt GREAT! Posted on May 10, 2011, in Aura Imaging, Energy Medicine, Hypnosis and tagged Aura Imaging, energy medicine, Hypnosis. Bookmark the permalink. Leave a comment.